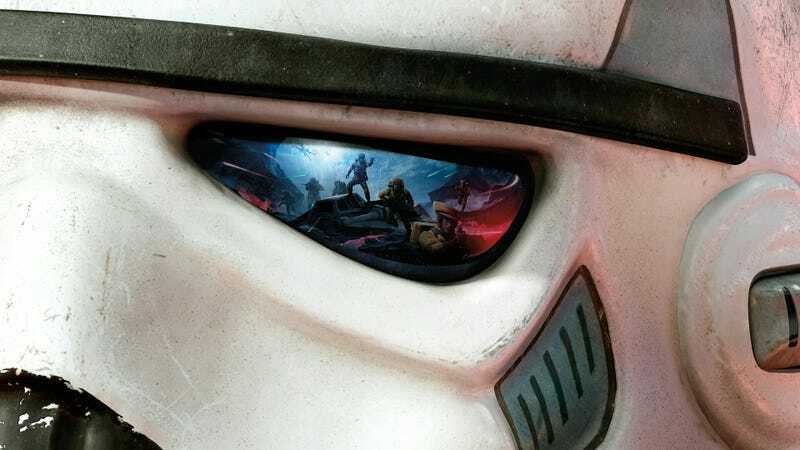 This weekend, EA DICE is running an open beta test for one of its newest titles — Star Wars: Battlefront. It’s a successor to a well loved pair of Star Wars games that focused on gunplay rather than being a Jedi knight. Here are my impressions of the beta, particularly the big Hoth battle. Star Wars: Battlefront is a Star Wars game alright. There’s no mistaking it. As soon as you’re dropped onto the battleground, you are surrounded by familiar sights and sounds from one of the most beloved franchises of all time. There are Star Destroyers flying overhead. An AT-AT lurches past you. There are laser bolts zooming past your head. You really feel like you are cowering in a trench dug into the snowfields of Hoth. Speaking of Hoth, the 40 player map is huge. The 40 player player vs player mode is deceptively simple in its objective. Two AT-ATs are walking across the entirety of the map. If you are the Rebels, destroy them before they have a clear shot to the shield generator. If you are the Imperials, keep the AT-ATs from getting destroyed. The huge map has varying elevation changes and long walking distances, which adds to the vastness of the landscape. However, the game is not necessarily good at making a match actually feel like a huge battle. The only time you’ll see a sizable group of soldiers together is when everyone is spawning at once. Most of the time, players will be scattered throughout the high ground, taking potshots from across the entire map before you even have a chance to see them. In fact, most of the players will be equipped with the Cycler Rifle ability that lets them snipe at opponents from ridiculous distances away every few seconds. Surely there are some tactics or class abilities to combat snipers everywhere? Not quite. First of all, there are no character classes like in previous Battlefront games. Like in many modern shooter games, you have one online character that you buy weapons and outfits for. Unfortunately, that means that there is no gradual, predictable progression during a match. The old Battlefront games allowed you to unlock new, more varied classes as you scored kills. But in the new game, you’re stuck with the weapons you had already permanently unlocked with the in-game currency, forcing you to grind matches after matches to earn enough credits to buy things like jetpacks or better guns. What about heroes and vehicle unlocks? Purely based on luck. There are no reliable ways to get in-game perks aside from praying that a power-up token will appear in front of you and that other people don’t beat you to it. It might be better you knew what power-ups you were picking up, but most of the time, you don’t. I don’t even think tokens appear in predictable locations either. So is it otherwise fun to play? “Play” is not quite the right word. You’ll be dying a lot. Maybe it has to do with the fact that the game is a modern shooter, but it’s incredibly unforgiving. If an opponent sees you before you do, you’re dead. It takes only a couple shots for you to die, which is great at replicating that the Battle of Hoth with bodies falling left and right, but it’s really not fun when you’re playing a game. You can theoretically “see” where people are with the radar on the HUD, but it might as well not exist when people are sniping you from across the map. The harshness of the gameplay seems at odds with the casual approach to shooting mechanics. There’s no recoil to the guns like in modern shooters. There are no ammo reserves to worry about. Shooting can’t be any more simple than just aiming and pulling the trigger, but it doesn’t mean that the game is easy. Character animations are hilariously awkward, especially the characters on jetpacks or Jedis with double jumps. Also, I don’t even know why jump is an option for regular troops because they don’t jump high or far enough to be of any use. One welcome design decision I’ve noticed was the inclusion of female Stormtroopers and characters that resemble black and Asian ethnic groups (and possibly more). Star Wars, it’s not just for white men anymore. For some reason, Luke on Hoth wears his Return of the Jedi outfit, complete with the prosthetic hand. It bothers me sooooo much. I don’t know yet if I’ll be spending money on the final product. Visually and aurally, it hits all the right buttons, but the gameplay just isn’t fun for me. The lack of a singleplayer story mode could definitely turn away more casual gamers who don’t want to face off against hyper-competitive FPS junkies online. The lack of classes and seemingly no weapon balancing whatsoever made the beta incredibly frustrating to play. I am reading a lot of positive reactions online though, so maybe I’m just not good at playing this game. If you would like to try it out, the open beta should be available on PC, PS4, and XBone until Tuesday the 13th.